Reading and share top 6 famous quotes and sayings about Foetus by famous authors and people. Browse top 6 famous quotes and sayings about Foetus by most favorite authors. 1. 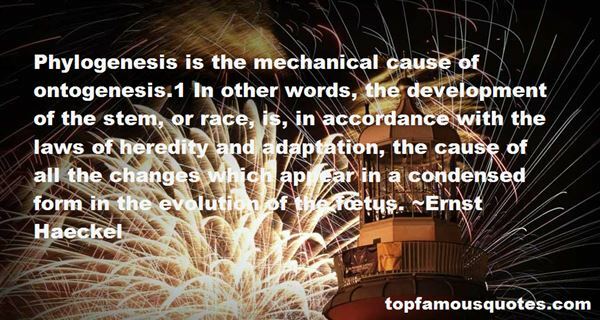 "Phylogenesis is the mechanical cause of ontogenesis.1 In other words, the development of the stem, or race, is, in accordance with the laws of heredity and adaptation, the cause of all the changes which appear in a condensed form in the evolution of the fœtus." 2. "Just like a human foetus, while in the uterus, retrieves and assimilates the components that allow its physical body to become whole and fit to emerge into the outer reality, the third dimension serves the purpose of shamanic pregnancy, which is about retrieving and integrating the fragmented pieces of the soul, finally giving birth to the multidimensional self." 3. "There was no one to be seen so she gave in freely to her sobs as she made her way home, pressed her arms against her stomach; the pain lodged in there like an ill-tempered foetus.Let a person in and he hurts you. There was a reason why she kept her relationships brief. Don't let them in. Once they're inside they have more potential to hurt you. Comfort yourself. You can live with the anguish as long as it only involves yourself. As long as there is no hope." 4. "Just as the unwanted pregnancy, there are unwanted people in your life you should strive to abort, and such abortion is not sin, nor harm, but the eradication of a destructive foetus." 5. 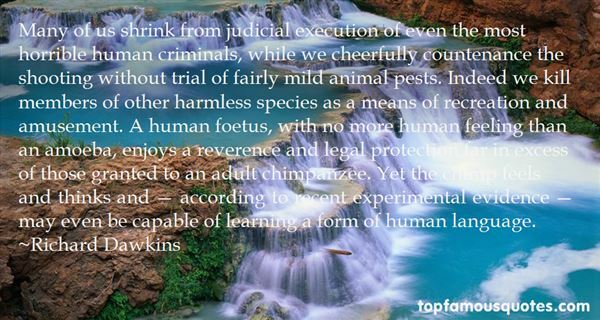 "Many of us shrink from judicial execution of even the most horrible human criminals, while we cheerfully countenance the shooting without trial of fairly mild animal pests. Indeed we kill members of other harmless species as a means of recreation and amusement. A human foetus, with no more human feeling than an amoeba, enjoys a reverence and legal protection far in excess of those granted to an adult chimpanzee. Yet the chimp feels and thinks and — according to recent experimental evidence — may even be capable of learning a form of human language." 6. "For quite some time now, like the foetus inside a womb, a terrible knowledge had been ripening within me and filling my soul with frightened foreboding: that the Infinite Universe is inflating at incredible speed, like some ridiculous soap bubble. I become obsessed with a miser's piercing anxiety whenever I allow myself to think that the Universe may be slipping out into space, like water through cupped hands, and that, ultimately—perhaps even today, perhaps not till tomorrow or for several light years—it will dissolve for ever into emptiness, as though it were made not of solid matter but only of fleeting sound." ...I overheard Dorothy talking to Mr Montrose and she was telling Mr Montrose that she thought that I would be great in the movies if he would write me a part that only had three expressions, Joy, Sorrow, and Indigestion."